TONOR's Wireless Microphone boasts an impressive new simple design, matte metal black build with incredibly durable construction. With strong anti-interference, accurate pickup, and quality sound output, this microphone is built for live stage performances. A simple and convenient microphone that gets all your work done. Moreover, the long signal range and 25 frequency channels give you more room to play and use. The mini, compact receiver is small in size but big on power. Grab one for yourself today! 1 - Please make sure to use the provided USB charging cable to charge your receiver. Other USB cables may not work properly. 2 - Please do not hold the bottom of the receiver where the antenna is positioned to avoid interfere the signal transmission. Do not self-cut the signal line. 3 - Do not hold the mic directly facing the speakers, otherwise it will create a static noise and interrupt output. 4 - The product is not recommended to be used with portable speakers with wattage below 15, such as JBL charge, Doss touch etc. 5 - This is not a bluetooth microphone. You need to plug the mini receiver into a sound system for audio output. 6 - Please check the battery status when you experience the microphone’s low volume. 7 - Please keep a spare battery in hand when using this microphone for some important occasions. GREAT SOUND QUALITY, EXTENSIVE USE - TONOR's upgraded wireless microphone system is now even better with improved sound quality, upgraded transmission technology, resulting in layered sound output. It can be perfectly used for karaoke with friends and family, parties, church, DJ, weddings, business meetings, classroom activities, outdoor or indoor stage performances etc. LONG RANGE FREQUENCY, 25 UHF BANDS - The system has 25 selectable UHF bands, reducing the possibility of interference and dropouts. 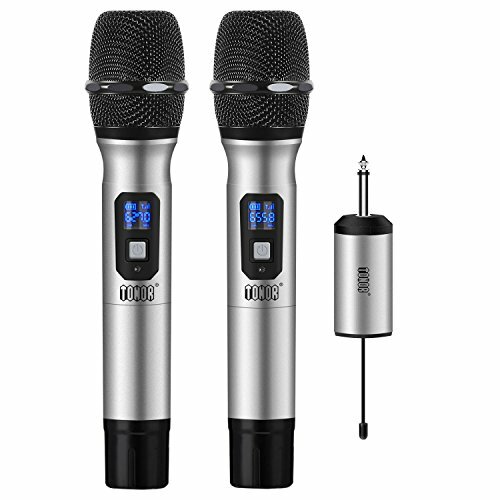 With the operating range of 150ft of the microphone and strong anti-interference ability, you have total freedom when you're singing on stage, taking assembly at school, using it for houses of worship, presentation halls and travel bus. EASY TO CONNECT, EASY TO PLAY - TONOR's wireless microphone system is easy to connect and play. Insert the receiver into the stereo, switch on the microphone and start using. There is no need of pairing or connecting in any other way. The 6.35mm connector on the receiver and an included 3.5mm adapter allows the microphone to be conveniently used for stereos, amplifiers, home theater systems, KTV, mixing consoles, tour buses and music equipments like soundbars. LONG BATTERY LIFE, RECHARGEABLE -The mini and compact receiver contains a built-in lithium battery that is rechargeable and lasts long. It can be used for 4-6 hours when fully charged for 2 hours. WHAT YOU GET - The microphone set includes handheld microphone x 2, rechargeable receiver with a 6.35mm plug x 1, 3.5mm adapter x 1, USB charging cable x 1, anti-skid ring x 2, windscreen x 2 and AA batteries x 4( not rechargeable). With great customer service, TONOR offers 40-day hassle-free return policy. If you have any questions about this product by TONOR, contact us by completing and submitting the form below. If you are looking for a specif part number, please include it with your message.